BRG's 6637 series allows you to change the color of any zone or zones with ease. 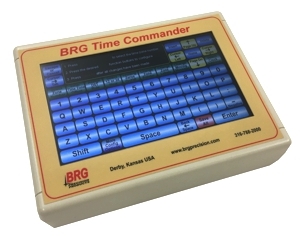 Introducing BRG's New Time Commander Graphical Remote Control Programmer Option. 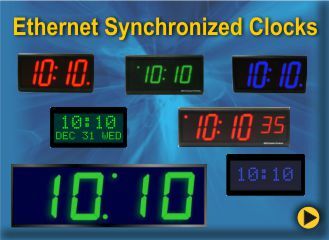 Recommended for Programmable Time Zone Clocks. The 6637 series time zone clocks have bar-segment LED time with white vinyl zone labels in the middle of each zone. The date is displayed with 10 character dot matrix LEDs. 6637 models can display 2-8 time zones. 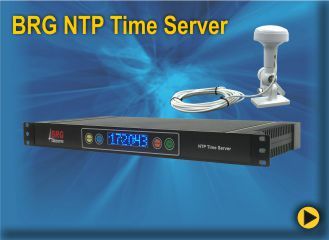 For easy clock management, an infrared (IR) remote control is included with every 6637 model. You can specify a radio (RF) remote, if preferred for no additional charge. 6637A-R18G 2 Zone Clock with 1.8"red bar segment LEDs for the time, optional green 1.2" dot matrix LEDS for the date and 0.75" white vinyl lettering for the zone labels. 6637C-R18G 4 Zone Clock with 1.8" standard red bar segment LEDs for the time, optional green 1.2" dot matrix LEDS for the date and 0.75" white vinyl lettering for the zone labels. 6637E-B18R 6 Zone Clock with optional 1.8" blue bar segment LEDs for the time, standard 1.2" red dot matrix LEDS for the date and 0.75" white vinyl lettering for the zone labels. 6637E-B18Y 6 Zone Clock with 1.8" optional blue bar segment LEDs for the time, optional yellow 1.2" dot matrix LEDS for the date and 0.75" white vinyl lettering for the zone labels. 6637E-B18Y-RL 6 Zone Clock with 1.8" optional blue bar segment LEDs for the time, optional yellow 1.2" dot matrix LEDS for the date and optional removable 0.75" white vinyl lettering for the zone labels. 6637E-R18G 6 Zone Clock with standard 1.8"red bar segment LEDs for the time, optional 1.2" green dot matrix LEDS for the date and 0.75" white vinyl lettering for the zone labels. 6637G-B18G 8 Zone Clock with 1.8" optional blue bar segment LEDs for the time, optional green 1.2" dot matrix LEDS for the date and optional removable 0.75" white vinyl lettering for the zone labels. 6637G-R18B 8 Zone Clock with 1.8" red bar segment LEDs for the time, optional 1.2" blue dot matrix LEDS for the date and optional removable 0.75" white vinyl lettering for the zone labels. 6637I-RL 3 Zone Clock with 2.5"red bar segment LEDs for the time, 1.2" red dot matrix LEDS for the date and optional removable 1.0" white vinyl lettering for the zone labels. 6637J-B25G 4 Zone Clock with 2.5" optional blue bar segment LEDs for the time, optional green 1.2" dot matrix LEDS for the date and optional removable 1.0" white vinyl lettering for the zone labels. 6637L-R25Y 6 Zone Clock with 2.5" red bar segment LEDs for the time, optional 1.2" yellow dot matrix LEDS for the date and optional removable 1.0" white vinyl lettering for the zone labels.